Dumping waste into rivers is bad. Putting chemicals in the air is bad. Whether climate change is directly effected by us or not it can’t hurt to be in favor of the enviorment. The denial of climate change fights in favor of the destruction of our planet. Ah, now you are getting to some specific issues, instead of an unproven theory about AGW being used to increase regulation and taxes. Waste dumping, chemicals in the air, deforestation - sure, let's do something about those things. They can be tackled with specific solutions as opposed to labouring on an overriding religion that asks for dollars. I`ll believe in global warming when someone can explain to me how the ice age in north America happened and ended with NO human intervention. Well the first explanation is oddly funny-farting. The domestication and breeding of livestock leads to gases such as Methane, which can increase the green house effect. New Zealand scientists claim to have developed a "flatulence inoculation" aimed at cutting down on the massive amount of methane produced by its sheep and cows. Such animals are believed to be responsible for more than half of the country's greenhouse gases, causing huge environmental problems. And that's New Zealand, let alone the rest of the world, then we have controlled burning of dry foliage which has been happening for tens of thousands of years to prevent larger fires-care to take a guess what a burning tree releases? Co2. Sure Sheep and Shrubs might be a proxy but guess who made it a problem? you seem smart enough to figure out the answer and there is your explanation(s). So New Zealand's scientists, insignificant tiny specks in history like us all, think they can control the earth by stopping cows farting? That just about sums up scientists. 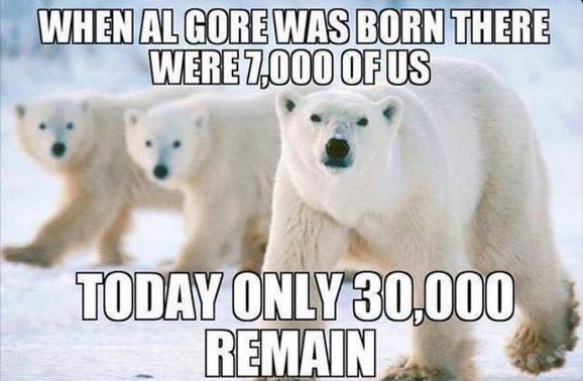 Years ago there was a mistake made in calling what appeared to be happening as Global Warming. So when we get what appears to be a Chilling Cold instead, people make fun of Global Warming. The problem is, there IS climate change, and there IS more radical weather, and many coastal areas ARE seeing rising waters, and there is vast amounts of proof that most glaciers ARE melting. What we are seeing is more frequent weather extremes. Hotter hots and colder colds and bigger storms and more flooding and more drought. Laughing it off as a farce means you aren't paying attention to the changing weather and reports of that weather, all over the world. Keep those blinders on, keep acting like an ostrich with its head in the sand, just joke about it. Whether or not it is all natural earth changes or humans, having been pumping pollutants into our waters, air, and bodies for a very long time makes a difference may be only somewhat debatable. Volcanic action puts a lot of gases into the air. Melting permafrost is releasing gases. When you look at the dead areas in the Gulf of Mexico you can see we do have an effect. When fisheries die, there is an effect. We are in part to blame and Global Warming was a misnomer but there IS change happening and it is making life worse for many people all across the world. The fact is the world is warming, the glaciers are receeding everywhere, the tundra is melting (which releases methane and adds a positive feedback loop) the polar cap is melting (which causes the ocean to absorb light/heat that would otherwise reflect back off snow, another positive feedback loop) and air bubbles found in glaciers, air trapped for 25,000 years or more, indicates there's a relationship between CO2 and temp. It just does. While some data exists concerning CO2 in historical glacier records, they also show that there is no linear correlation between the two. And the ocean is not heated by the Sun, except in slight manner. If the Sun, was the only source of our heat ... we would freeze to death. The greatest contributor to the climate, in the northern hemisphere ... is the gulf stream. It's absense, during the middle ages, caused freezing temperatures. You can directly observe it's effects ... if it's cold in sweden, it's warm in iceland, if it's warm in sweden, it's generally cold in iceland. During the past decades, the golf stream has gone further north and not just to the Jan Mayen area. It is neither the sun, CO2, nor caterpillars flapping their wings in Africa ... that cause the golf stream. And even if the sun affects water temperature, it only affects the surface temperature. And it is the deep current temperature, that causes the golf stream ... factors that affect the deep water stream, is magma flow, and magma heat. The ideology, that "man" is "God" ... is pathetic in my opinion. It doesn't matter if Phage comes in here, or others like him, and tries to get in the "last" word. That then is used in other discussions to say "debunked". No it isn't debunked, people just got tired of the humbug and moved on. The word "science" comes from latin, and doesn't mean "magic" ... it means "knowledge". Knowledge isn't absolute ... so Phage's words, have no greater meaning than any other mans words. Including yours, and mine ... at the end of the day, we have "theories" at best ... and theories aren't facts. But many theories, aren't there because we don't know better ... we do, but people are selling their work based on hypes. Take the dynosaurs as an example, where would the fun be if they weren't such a "mystery" ... they are no mystery, of course ... but that wouldn't sell books, would it. Same thing about the bermuda triangle ... it sells ticket to movies, and eventually pay Phage's salaries, and mine ... even if indirectly. This is the same thing, "greenhouse" effect ... it's Pagan religion, just like Christianity, Judaism, Islam and any other fear mongering doomsday religion. Like the "Big Bang" theory, the global warming by man, are merely an extent to these religions. We're wicket and must be punished ... and then we need to pay tribute, and in the end ... the Vatican is built out of pure gold. And the "dream", is that we all burn in hell outside the walls ... while the "few", rich and famous, live like kings inside them. That' is what is being opposed ... CO2 in the air, isn't bad ... we can grow more crops then. It's not the "science" in the correlation, that is bad ... it's the result, that is. "We are all going to die", doomsday theories. We don't need it, never did and never will ... what we need, is to expand our knowledge in how the cosmos and the earth work, so we can better make use of it. Point of all this is, we don't cause anything ... we're animals, and we are thriving because of the climate change. The correlation between man and climate, is reversed ... in favor of pagan religions. And that is my view on the matter. You can boil down the global warming religion to it's simplest form. "If you pay more tax and only do what we tell you to do, we can control the world to keep you safe"
That's the proposition, without the dress up. It's really no different from selling tonics to make you live forever. The debate would move on to fertile ground if there was a clear admission that the science is not even close to settled and at this point we're using very limited information and making a lot of assumptions to try and grasp something we don't really understand. Instead, we get propaganda, like "97% of scientists agree" and doomsday scenarios. i know i really shouldn't be surprised by this point but damn, the aggressive ignorance in this thread is really somethin else. also mildly amusing that everywhere else i've seen this 'news' it's been met with incredulity and derision.... it's only here on the mighty ATS [and probably a few other noxious sinkholes] where anyone's even trying to spin this as a remotely positive action from Trump. And yeah, i'm sure that's only going to reinforce the notion that you must be right , blah blah mainstream fake news blah, but it's honestly absurd, and not in a fun way. I used to absolutely adore this site, but it's rapidly becoming nothing more than a tired, tasteless joke. I think their is a lot stopping anyone from doing so. The almost draconian TOS here for instance. The mud-pit is the closest you could come to calling out shills and idiots as such.